Eric Clapton Up Tempo Blues. By Eric Clapton. By Eric Clapton, Michael Casswell. Lick Library. Technique, Blues, Instruction. DVD Only. Lick Library #MUSRDR0213. Published by Lick Library (HL.393092). 5.5x7.5 inches. English(UK). With Michael Casswell. Learn killer licks in the style of your favourite players, and jam along with our superb guitar jam tracks! Each Quick Licks DVD includes an arsenal of licks in the style of your chosen artist to add to your repertoire, plus backing tracks to practice your new found techniques! The DVD is presented by Michael Casswell, a highly sought after freelance guitarist and producer. He has played and toured with many well known bands and artists as diverse as Brian May, Cozy Powell and Ronan Keating to name just a few. His playing can be heardon numerous film and TV soundtracks. 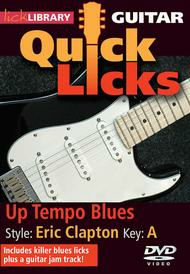 Learn killer licks in the style of your favourite players, and jam along with our superb guitar jam tracks! The DVD is presented by Michael Casswell, a highly sought after freelance guitarist and producer. He has played and toured with many well known bands and artists as diverse as Brian May, Cozy Powell and Ronan Keating to name just a few. His playing can be heardon numerous film and TV soundtracks.